The theme of this year’s Wales Tourism Week is ‘Collaborating to Compete’ which aims to highlight the power of partnerships across the industry. 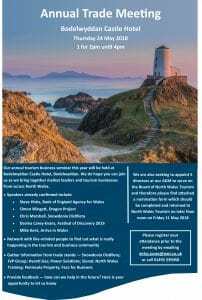 Co-ordinated by the Wales Tourism Alliance (WTA), there will be a series of events throughout the week held by the industry to highlight how different enterprises within sectors co-operate, provide excellent self-employment and career opportunities as well as customer service excellence. 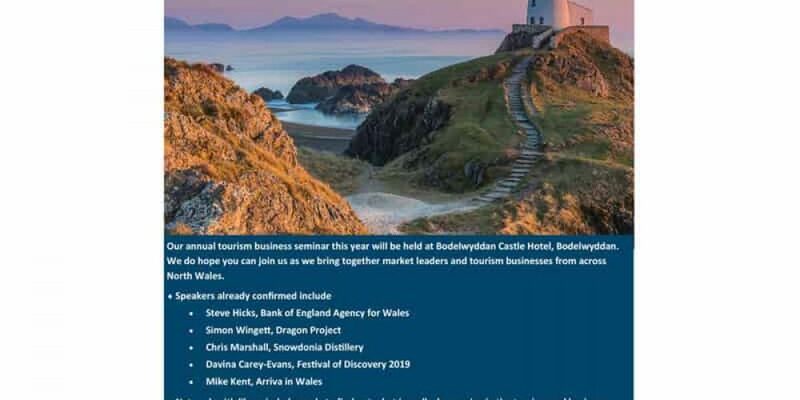 Tourism businesses are being urged to organise events that highlight the importance of the industry and emphasise partnership during Wales Tourism Week. Friday 18 May @ NWT office – JVP presenting workshop with Cath Harrison, Managing Director of JVP Group and Jobs in North Wales, will be sharing her top tips on writing an effective CV and nailing interviews, through an interactive You’ll be given the opportunity to take part in an ‘Ask the Expert’ Q&A session, where you can gain even more tips and one to one advice on how to make sure you stand out from the crowd. Please let us know if you’re planning to organise an event around the week by e-mailing press@nwt.co.uk. 2018 sees the third year of the North Wales Festival of Gardens, a unique event which brings together the finest gardens within one of the most beautiful regions of the British Isles. The festival this year will take place over a sixteen-day period from Saturday 2nd June until Sunday 17th June. The festival will be officially opened at the beautiful Bodrhyddan Hall, Rhuddlan on Saturday 2nd June and will include a walk around the gardens, afternoon tea on the lawn, talk by the owner and a guided tour of the house. Admission to the launch is by ticket only and can be purchased online here. Gardens taking part in the festival include: Bodnant Garden, Tal y Cafn; Gwrych Castle, Abergele; Caerau Uchaf, Bala; Penrhyn Castle, Bangor; Crug Farm Plants, Caernarfon; Plan Tan y Blwch near Maentwrog; Portmeirion and Plas Brondanw at Penrhyndeudraeth, Ffestiniog and Welsh Highland Railways; Plas Newydd, Llanfairpwll; Plas Cadnant Hidden Gardens, Menai Bridge; Bodrhyddan Hall Gardens, Rhyl; Nantclwyd y Dre, Ruthin; Powis Castle and Gardens near Welshpool, the Centre for Alternative Technology; Machynlleth; The Dingle Garden near Welshpool; National Trust Chirk Castle near Chirk and National Trust Erddig near Wrexham. For further details about the launch, festival and gardens please visit www.gardensnorthwales.co.uk or call 01492 531731. You should have all received your supply of the Bedroom Browsers and other publications including Gardens North Wales; Great Days Out, Golf in North Wales and Fishing in North Wales. If this is not the case please email distribution@nwt.co.uk or call 01492 573887. Dayinsure Wales Rally GB, Britain’s round of the FIA World Rally Championship, is delighted to announce that North Wales Tourism has been appointed as the Official Accommodation Partner for this year’s prestigious event (4-7 October). Last year’s Dayinsure Wales Rally GB attracted more than 100,000 visitors plus a full 150 car entry with fans and teams travelling from 24 countries to experience one of the most hallowed events on the World Championship calendar. Being such a global attraction, the rally already brings £9.4m of economic benefit to Wales. The partnership with Colwyn Bay-based North Wales Tourism (NWT) will assist spectators, competitors, teams, officials and media with their accommodation requirements across the region. It also adds another important partnership to the event’s large engagement with local businesses in the area. Most of you would have heard of the North Wales Growth Deal, our MD Jim Jones as a board member of the North Wales & Mersey Dee Business Council has been working with the rest of the private sector team leads and public sector over the last few years to bring the plan into fruition. 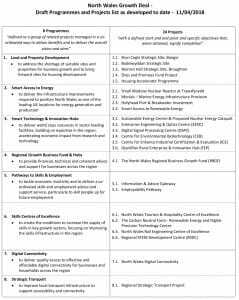 Attached is a snapshot of the priorities that have been developed, which we have a vested interest in a many of them. The bid is now being taken forward by The North Wales Mersey Dee Business Council in partnership with the North Wales Economic Ambition Board. If you would like any further information about the growth bid please email info@nwmdbusinesscouncil.org. The latest available data from the International Passenger Survey is available below. This shows the volume and value of visits to the UK by overseas residents for the most recent month and quarter. The survey is run by the Office for National Statistics (ONS) – monthly data is generally available 7 weeks after the end of each month and quarterly data is generally available 4 months after the close of each quarter. The roll-out of the revised Visit Wales Quality Assurance guidelines for the serviced and self-catering sectors has begin in April 2018 following recommendations from a review undertaken by the National Tourism Organisations of Wales, England, Scotland & Northern Ireland and the AA. Also taking into account customer and industry feedback, the revised schemes will see more emphasis on the quality of experience with less emphasis on the provision of facilities. VW have aligned the revisions to the Quality Assurance schemes with a refresh of the Cymru Wales branded display materials which sees new style external grading plaques, certificates and additional digital branded components which will be issued to all graded businesses. Business will not need to request the new materials; they will be issued during the early summer months. A selection of professional and cost effective training available for businesses in North Wales including First Aid and Health & Safety; Food Safety & Hygiene and Business Skills Workshops. For more details please contact http://www.you-train.co.uk/ or call 01745 538953.